Foursquare has begun rolling out “local updates,” a messaging service that allows businesses to tell customers about things like specials, new products or other information. The tool is free for businesses and will be available to the nearly 1 million businesses Foursquare works with later this week. Businesses can already offer deals through Foursquare, which appear in the venue information page when users check in, and can include a discount with purchase, a free item, or a loyalty-based special. With the new offering, businesses can notify people more proactively about deals at their favorite stores and restaurants. The company envisions the service as the digital equivalent of a sidewalk chalkboard. Foursquare users who check in regularly at a place, or “like” a venue via its app, will get updates from them automatically when they’re in the same city. People can also choose to block updates from a particular business. National retail or restaurant chains already sharing local updates include H&M, Togo's Sandwiches, Outback Steakhouse and Wolfgang Puck. New York City-based businesses and organizations using the new tool include Luke's Lobster, Northern Spy Food Company and New York Public Library. 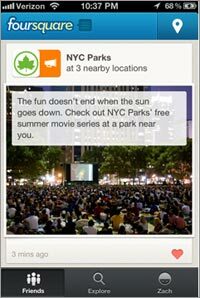 A Foursquare blog post Wednesday showed some sample local updates featuring photos with short text messages, including a pitch from H&M on low-priced summer clothing and a NYC Parks Department message promoting its summer movie series. The ability to provide local updates is the first step in Foursquare’s effort to upgrade its dashboard tools for small businesses to better connect with the location-based service’s 20 million active users. It also serves the company’s broader goal of turning Foursquare from a simple check-in app into a legitimate business. To that end, its redesigned app introduced in June added features to make it a more direct competitor with recommendation services like Yelp. The new updates feature should also help Foursquare better compete with deal sites like Groupon, which have increasingly pushed into mobile, and Square, which last month added its own digital punch cards for small businesses. Exactly how Foursquare will drive more revenue isn’t clear. But the more businesses value its offers, the more likely the company can charge for an expanded set of services or more prominent placement.